Category: DIY shop. Tags: bonding agent, diy, glue, no more nail. 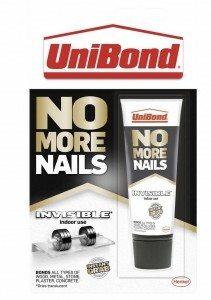 UniBond No More Nails Original UniBond’s No More Nails is a high strength adhesive that eleminates the need for nails and screws in many applications. It is ideal for fixing polystyrene mouldings, decorative wall panels, plasterboard, carpet and carpet grippers and worktops, etc. The heavy duty glue adheres to most building materials including wood, plaster, ceramic, concrete, metal, stone, brickwork and glass. 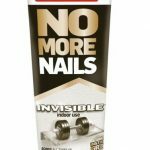 No More Nails Invisible is non – hazardous and dries by water evaporation. Therefore at least one surface to be bonded must be absorbent. Use: Ensure that surface is clean and free from dust, grease and loose material Apply adhesive to the item being bonded in continuous beads 15cm apart Position item with firm pressure and twisting slightly, ensure good contact before releasing pressure Wipe away excess and clean residues of adhesive with water Allow around 24-hours to dry.